Productive Mama Bottom Line: easy to use web-based time tracking for projects. Integration with smart phones and other online applications, such as Asana, Chrome, BaseCamp and more. The free version has been sufficient for me. Highly recommend for those of you who bill for time. Suggested for those of you who just need to keep an eye on your work productivity. Tracking your time on projects is useful if you work at home or for yourself. Tracking helps you know for sure (not just guess) how long tasks are taking or how long you spend on the administration of your business vs. the tasks of your craft vs.marketing, etc. Tracking your time is essential if you are a contractor of any kind and need to bill clients. I use Toggl.com. This free tool of course has a paid version that is full of great features, especially if you work with a team. But as an independent contractor for a small organization, I used the free version. The main feature I missed was being able to easily create an invoice from the reports. Instead I used my time report to create my own invoice separately. But otherwise, Toggl has loads of great features in the free version. First, it’s so easy to use! You just click Go and it starts your time. You can set which client or project you are on before you start the time or edit that later. I usually did that from my laptop at home. If I was out, I could use the smartphone app. 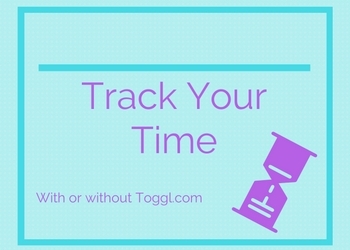 You can also track time when you’re offline and Toggl will sync it when you are back online. The next great feature are the easy reports. I could easily create a report detailing my projects and time spent in pdf or spreadsheet form. The reports are easy to create, read and are quite beautiful. Toggl is easy to set up and you can have an unlimited number of clients and projects, each color coded. The Basic plan is FREE for teams of five or less. Using this free plan, I learned a lot about my work habits, but was also able to more accurately quote expected project times for clients. I learned that I tend to work for an hour before needing to get up and move around (which is great and what “they” are saying is healthy). I also learned that I took less time to do some projects than I expected. And more time on others. I also used the various graphs to show me my work patterns. I also felt good knowing I could account for any minute I billed, tying each minute to a project. Not only could I bill to a general project, but I could add a note to specifically identify WHAT I was doing for that project. Here’s a post from a mom on how she used Toggl to help her work more efficiently at home with small kids. She also has a freebie on that page on how to limit interruptions. If you need features beyond Toggl’s free plan, other plans start at $10 a month.